Far above the tourist crowds, the Hill Apartment No. 6 is a luxurious apartment in an enclave of only eight. 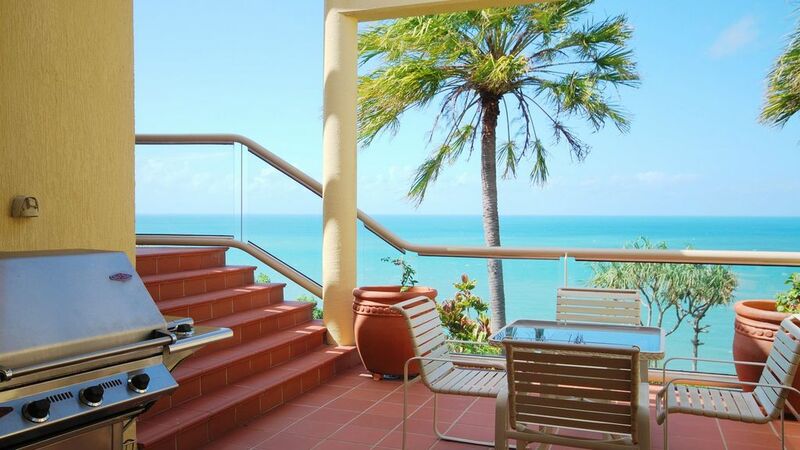 The apartment has the most elevated aspect available for holiday rentals in Port Douglas. Access by stairs to the apartment requires a reasonable level of fitness as there is no lift in the complex. However from the apartment, you will be rewarded with breathtaking views over Port Douglas, the Coral Sea and the surrounding mountains. The lounge room has an eclectic book and CD collection, Plasma TV and DVD. Concertina glass doors on two sides of the room fold back to provide access to the outdoor patio with views along Four Mile Beach. Upstairs leads to the kitchen which overlooks the living area. The kitchen is furnished with granite benches and a full compliment of modern appliances. The cupboards stocked with all the crockery, glassware, cutlery and cookware to make your stay more comfortable. On this same level is the ocean-facing dining room with a private sun-filled patio and extra outdoor dining table. Enjoy the warm ocean breezes and views of passing yachts - also cleverly reflected in the mirror which runs the full length of the dining room. In addition on this level is a generous bathroom, with featured circular wall and high ceiling, and laundry facilities. Superbly appointed with three bedrooms, all located on the third level, and two bathrooms. The master bedroom has an en-suite, the remaining bedrooms share the full sized bathroom. The complex features a stunning 15 metre pool. Poolside, there is an entertaining area with bar fridge, spa, water feature and sun decks. Conveniently located there is stair access to Four Mile Beach. Macrossan Street is also just a short walk away. There is undercover parking available for each apartment.